Undergraduates within colleges can pay rent that differs by more than £1000, analysis by Varsity has found. Certain colleges charge significantly disparate prices for their undergraduate rooms, a Varsity investigation has found. Varsity looked at the difference in prices of the most and least expensive undergraduate room in each college. Where colleges have sets, the figure that each individual would pay was used. Data obtained through Freedom of Information requests, as well as from publicly available sources, found a disparity of £1000 or more in the prices that undergraduates at Trinity Hall and Peterhouse pay for their accommodation every term. The disparity at Trinity Hall is £1036, and exactly £1000 at Peterhouse. The cheapest rent at Trinity Hall is £732 whilst the most expensive is £1768. A Kitchen Fixed Charge of £175 also applies in both cases. The cheapest room at Peterhouse costs £800 while the most expensive costs £1800. There is a Kitchen Fixed Charge of £184. Relative prices at both colleges are determined by factors such as size and facilities. A spokesperson for Trinity Hall told Varsity that the level of rent, based on these factors, was “determined by the JCR a few years ago in consultation with the Junior Bursar”. In contrast, two colleges – Girton and Newnham – charge all undergraduates the same price. Termly rent costs £1973 at Girton and £1497 at Newnham. Newnham also has a Kitchen Fixed Charge, although it announced last week, in response to reporting by Varsity, that it would trial an opt-out. On the other end of the spectrum, five colleges have a difference of under £400. Similarly to Girton and Newnham, Gonville and Caius charges all non-fresher undergraduates the same rate. Freshers at the college have a comparatively small variation in prices of £120, as they are housed on the same site in two buildings, Harvey Court and the Stephen Hawking Building, on West Road. Sidney Sussex and Homerton have differences of £265 and £316 respectively for all their undergraduates. Across all colleges, excluding mature colleges, the average difference between cheapest and most expensive termly rent in each college is £564. College accommodation for students with families, which include more amenities and larger space compared to undergraduate facilities, were kept separate from these calculations to focus on rooms with comparable amenities. Mature colleges, which set aside a significant proportion of such rooms, were not included. The finding comes at a time when rent is under increased scrutiny in Cambridge. A Varsity investigation last week found dramatic differences in the average rents of different colleges. Notably, the investigation revealed that students at Newnham pay 67% more in rent and fixed charges than the average student at Homerton. In addition, five colleges currently have Cut the Rent campaigns calling for a reduction in costs, as well as an increase in room quality. 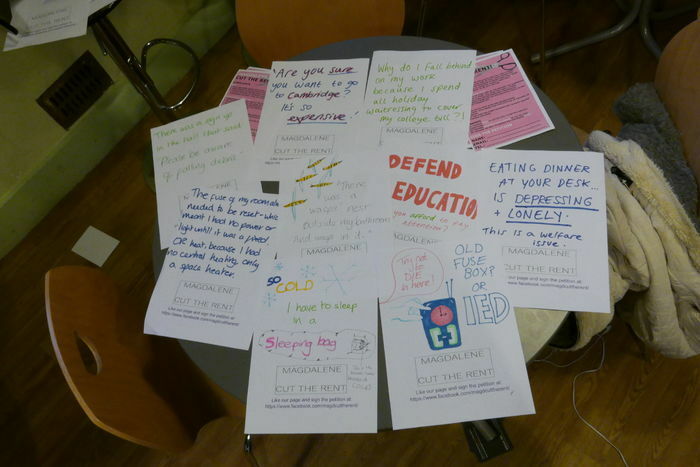 The campaigns have been launched at Magdalene, Murray Edwards, Robinson, Newnham and Downing. Up until now, however, different prices within colleges have received little attention. Despite the disparity, bigger differences in accommodation prices can give students more opportunities to choose a room corresponding to what they can afford. Peterhouse writes on its website, for instance, that its accommodation can “suit all budgets”.